We pick up you from your hotel/riad, the bus station or the airport. We go straight to Merzouga, town we reach in the afternoon. After relaxing a few minutes, you will take some of you luggage in small bag (the necessary for the night in the desert) and leave the other luggage in the hotel. 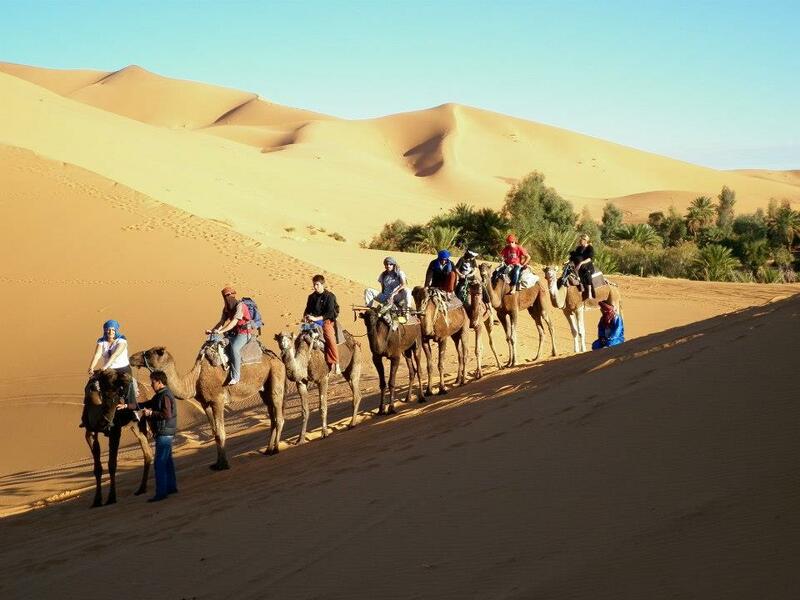 When we are ready, we will ride the camels on an adventure crossing the Erg Chebbi sand dunes. Be ready for the best sunset ever in the high dunes! This is a great opportunity to take lovely pictures of the sunset and sunrise. After the welcome tea, you will be able to enjoy the stars and the shiny moon, in the darkest and clearest night you can see. We taste some local food for dinner and talk with local people in the full equipped camp, with drums music and great environment in the middle of the Sahara. We sleep in traditional nomad tents till the sunrise. We get up early to see an incredible sunrise, again from the high dunes. In the morning we ride the camels back to Merzouga, where we have a traditional breakfast and a good shower in the hotel in Merzouga. We start our journey back to Marrakech via Risani, the palm trees oasis of Alnif and Tazarine, Draa Valley, Ouarzazate (Taourirte Kasbah, the movie film center) and back to Marrakech. We arrive within the evening. We pick up you from your hotel/riad, the bus station or the airport. We start the journey from Marrakech to Dades Gorges across the Tizi-n-Tichka Atlas pass, with far-reaching views across the mountains, to the traditional High Atlas Berber villages. Then we continue to Kasbah Ait Benhaddou to visit the UNESCO World Heritage Site of Ait Benhaddou, a spectacular fortified village. We have lunch in Ouarzazate, where we visit Kasbah Taourirt and the atlas studios. This is the famous Moroccan capital of cinema, where many famous films were shot. We continue to Dades Gorges though roses and Dades Valley. We spend the night in a riad/hotel in Dades Gorges. After the breakfast, we go from Dades Gorges to Sahara Desert in Merzouga. Berber villages are scattered along the way. We pass through Todra Gorges, Tinghir, Tinjdad, Jorf and Erfoud, where we’ll feel the beginning of the Saharan oasis of Tafilalet. We continue to a Hotel in Merzouga. After relaxing a few minutes, you will take some of you luggage in small bag (the necessary for the night in the desert) and leave the other luggage in the hotel. In the afternoon, we ride the camels on an adventure crossing the Erg Chebbi sand dunes. Be ready for the best sunset ever in the high dunes! This is a great opportunity to take lovely pictures of the sunset and sunrise. After the welcome tea, you will be able to enjoy the stars and the shiny moon, in the darkest and clearest night you can see. We taste some local food for dinner and talk with local people in the full equipped camp, with drums music and great environment in the middle of the Sahara. We sleep in traditional nomad tents till the sunrise. We get up early to see an incredible sunrise, again from the high dunes. In the morning we ride the camels back to Merzouga, where we have a traditional breakfast and a good shower in the hotel in Merzouga. We start our journey backing to Marrakech through different areas and berber villages (Alnif, Tazarine N’kob ) until Ouarzazate, where we use the same road back to Marrakech. We arrive to Marrakech within the evening. We pick up you from your hotel/riad, the bus station or the airport. We start the journey from Marrakech to Dades Gorges across the Tizi-n-Tichka Atlas pass, with far-reaching views across the mountains, to the traditional High Atlas Berber villages. We have lunch in Ouarzazate and we continue to Dades Gorges through roses and Dades Valley. We spend the night in a riad/hotel in Dades Gorges. We sleep in traditional nomad tents till the sunrise. We get up early to see an incredible sunrise, again from the high dunes. In the morning we ride the camels back to Merzouga, where we have a traditional breakfast and a good shower in the hotel in Merzouga. We start our journey to Ourzazate through different areas and Berber villages (Alnif, Tazarine N’kob ). We arrive within the evening. In the morning we visit the UNESCO World Heritage Site of Ait Benhaddou, a spectacular fortified village. We have lunch in Ouarzazate, where we visit Kasbah Taourirt and the atlas studios. This is the famous Moroccan capital of cinema, where many famous films were shot. We leave Ait Ben Haddou and start heading towards the majestic Atlas Mountains. Cross the High Atlas Mountains via the highest road pass in Morocco Tizni Tichka 2260m high, offering impressive views of valleys, mountains and many Berber villages. 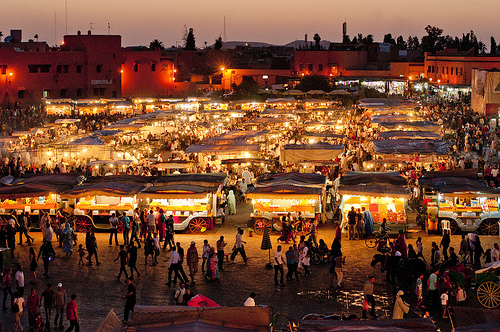 We arrive to Marrakech within the evening. After the breakfast, we go from Dades Gorges to Sahara Desert in Merzouga. Berber villages are scattered along the way. We pass through Todra Gorges, Tinghir, Tinjdad, Jorf and Erfoud, where we’ll feel the beginning of the Saharan oasis of Tafilalet. We continue to a Hotel in Merzouga, where we spend the night. In the morning, after the breakfast, we make a unique tour around Erg Chebbi in a 4×4 vehicle. We visit dark skin (gnaoua) who plays music with African instruments. After that we take a look to the mines and we have a lunch with a nomad family, who will make us a traditional Berber pizza in the rocks. In the afternoon, we ride the camels on an adventure crossing the Erg Chebbi sand dunes. Be ready for the best sunset ever in the high dunes! This is a great opportunity to take lovely pictures of the sunset and sunrise. After the welcome tea, you will be able to enjoy the stars and the shiny moon, in the darkest and clearest night you can see. 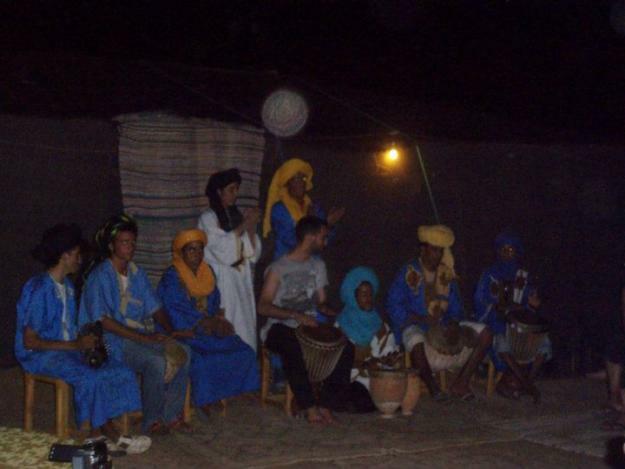 We taste some local food for dinner and talk with local people in the full equipped camp, with drums music and great environment in the middle of the Sahara. We sleep in traditional nomad tents till the sunrise. We get up early to see an incredible sunrise, again from the high dunes. In the morning we ride the camels back to Merzouga, where we have a traditional breakfast and a good shower in the hotel in Merzouga. We start our journey to Ourzazate through different areas and Berber villages of the atlas mountains (Tinjdad , Tinghir Todra Gorges, Boumalene-du-Dades ). We arrive within the evening. We pick up you from your hotel/riad, the bus station or the airport. We start the journey from Marrakech to Dades Gorges across the Tizi-n-Tichka Atlas pass, with far-reaching views across the mountains, to the traditional High Atlas Berber villages. We have lunch in Ouarzazate, where we will get the chance to visit the universal Heritage Site of Ait Benhaddou Kasbah. This Berber Kasbahs has been used as a very important destination for international filmmakers. We continue to Dades Gorges through roses and Dades Valley. We spend the night in a riad/hotel in Dades Gorges. We sleep in traditional nomad tents till the sunrise. We get up early to see an incredible sunrise, again from the high dunes. In the morning we ride the camels back to Merzouga, where we have a traditional breakfast and a good shower in the hotel in Merzouga. We start then our journey to Fes, stopping on the road to enjoy tea with a nomad family and passing through the High Atlas Mountains again. We stop by a town called Midelt where we have lunch. This town is a very impressive mountain city, at 1.488 meters of altitude, well situated lower down the Jbel Ayachi (3.737 meters). In the afternoon we continue to the legendary city of Fes. The arrival to Fes is within the evening. ** NOTE: If the itineraries that we offer do not match what you are looking for, contact us and we will organize a trip following your exact needs and requirements. The price of the trip will depend on the accommodations.